An example of a small unmanned aircraft systems, or drone, as discussed Wednesday at Speak Up Newport. 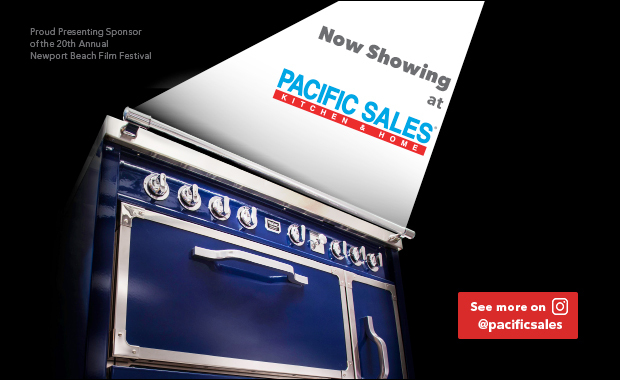 Small unmanned aircraft systems, better known as drones, have gotten quite the buzz lately. Flying the toy-like machines is a hobby to some, but those concerned about privacy and safety have been vocal about regulating the use of drones. 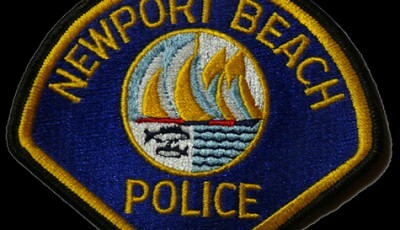 Newport Beach City Council was briefed on the issue last month. The community group Speak Up Newport got a flyover during their meeting Wednesday night. Magnetic interference prevented Newport Beach Police Department IT Coordinator Tom Encheff from demonstrating his drone’s abilities in the Community Room at Civic Center. He and Lieutenant Damon Psaros did provide an overview of what drones can do and answered questions about laws pertaining to them. Newport Beach does not specific laws against using a drone, but the Federal Aviation Administration does. Because of Newport Beach’s proximity to John Wayne Airport, most of the city falls into a 5-mile area considered Class C airspace. This means that both recreational and commercial operators of drones must contact the flight tower at the airport for approval to fly a drone. 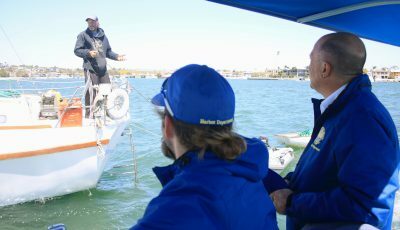 “You can’t fly off-the-cuff recreationally,” Encheff said. 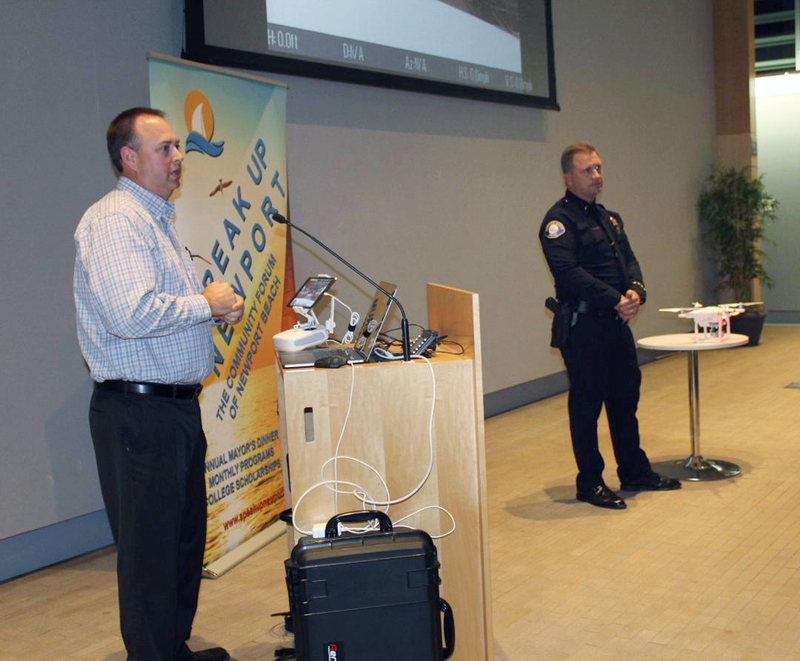 Newport Beach Police Department IT Coordinator Tom Encheff (left) and NBPD Lieutenant Damon Psaros talk about drone usage in the city during Wednesday’s Speak Up Newport meeting in the Community Room at the Civic Center. That 5-mile area encompasses most of the city, with the exception of a sliver of Balboa Peninsula and part of Newport Coast. “Even though John Wayne is considered a smaller airport, it has a very restricted amount of airspace around it, and because of that, the rules for small UAS flight are restrictive,” Encheff said. He acknowledged that most drone users are unaware of the flight restrictions and have probably never called the airport. 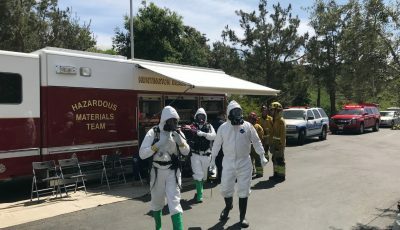 In the last two years, there have been more than 85 computer-aided dispatch events involving drones in Newport Beach, but the air isn’t their jurisdiction. A homeowner can’t claim that their airspace is being violated. “No one can own…the air, so your property is your property on the ground. But the airspace is still controlled by the FAA,” he noted. Encheff added that only two cases have been prosecuted by the FAA that he was aware of. Some criminal laws do protect residents from unwanted voyeurs, Psaros said. 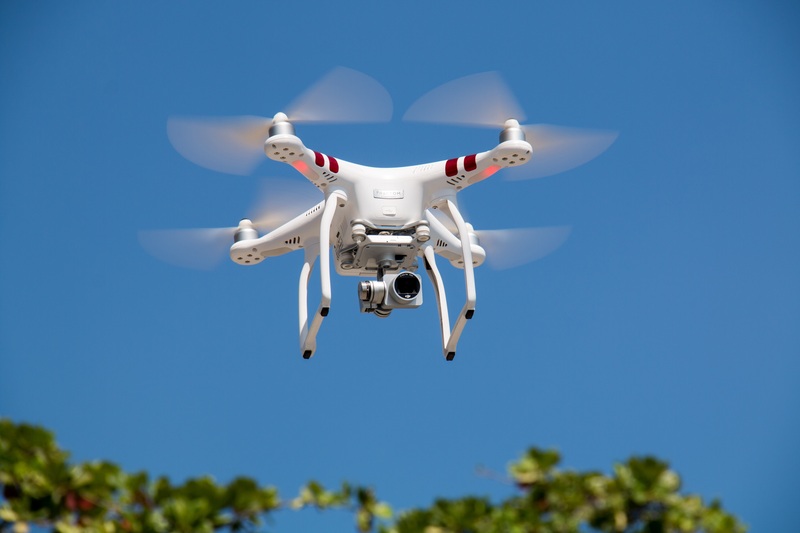 Laws against eavesdropping/invasion of privacy, trespassing, disorderly conduct/concealed recording, and stalking can be applied to questionable drone users. 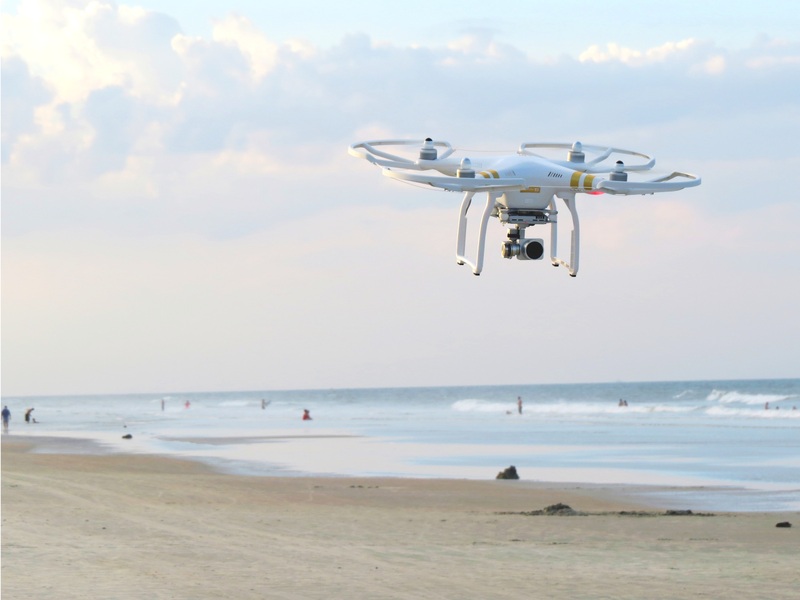 Laguna Beach enacted a new ordinance in July to prohibit drones from flying over certain areas, but Newport Beach only enforces existing laws applicable drones at this time. The NBPD does not have an official drone program for law enforcement, but they shared videos taken with drone technology that showed how useful it could be a hostage or SWAT situation. Psaros said the police department was not considering a drone program, mainly due to “the big-brother” privacy concern. The fire department and marine department, who could possibly use drone technology for saving lives, would not face the same scrutiny in drone usage as the police would, he said. In fact, the marine department used drones for shark identification during the Junior Lifeguard program this past summer, just to be safe. 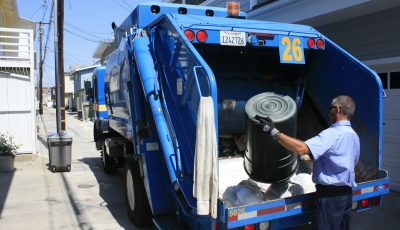 “They did some sweeps of the coastline,” Psaros said. For more information, visit knowbeforeyoufly.org and speakupnewport.com. An example of a small unmanned aircraft systems, or drone, as discussed Tuesday by Newport Beach City Council.